Watch Outlander Season 2 Episode 4 online via TV Fanatic with over 8 options to watch the Outlander S2E4 full episode. Affiliates with free and paid streaming include Amazon, iTunes, Vudu, YouTube Purchase, Google Play, STARZ Play, Verizon On Demand, and STARZ (Via Amazon Prime). 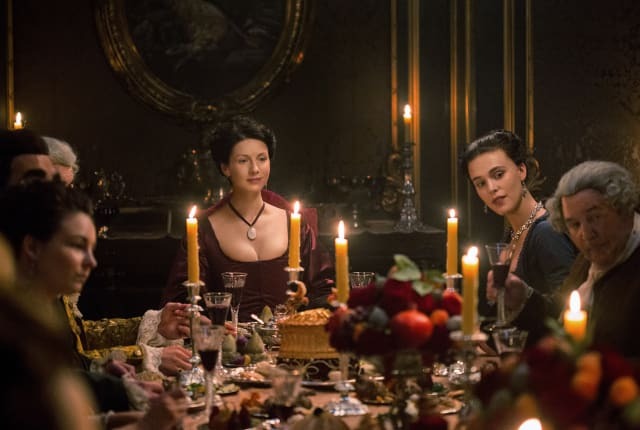 On Outlander Season 2 Episode 4, Claire and Jamie host a dinner party, and when Claire reveals Jack Randall is alive it affects Jamie in a surprising way. Murtagh: Jamie's in a cheery mood. Claire: Yes. I told him Black Jack Randall is still alive. I don't know what you were so worried about. Permalink: Yes. I told him Black Jack Randall is still alive. I don't know what you were so worried about. Claire: Jack Randall is alive. I met his brother, Alex, on our first visit to Versailles. He works for the Duke. He said that Randall was injured while on duty, and that he was very much alive. Jamie: This is wonderful news. Why did you wait until now to tell me? Permalink: This is wonderful news. Why did you wait until now to tell me?